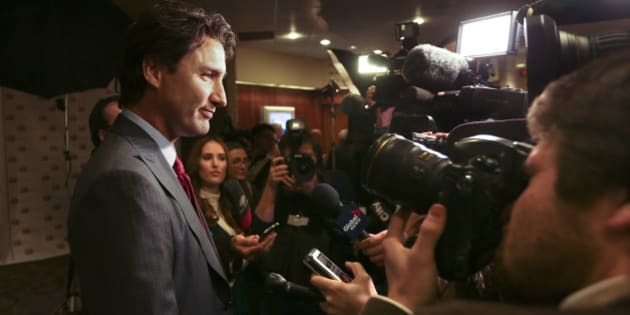 Like long-time convicts suddenly released into the light of day, Parliament Hill journalists were perplexed at the burst of information on the first day of the Justin Trudeau government. There was the new prime minister striding out from Rideau Hall to take questions, several questions, with no preordained limit and no list. In his very first response, Trudeau said that regular, respectful interactions with journalists were among his top priorities -- a key element in a government he promised would be transparent and inclusive, likely the first time in Canadian history where a head of government cited good relations with the news media as a central theme. It has never been much of a vote-winner. An astonishing punctuation point was made at the end of the day when Canada flipped on CBC's The National to see Peter Mansbridge and a cameraperson given extraordinary behind the scenes access -- allowed to follow the prime minister from an early morning flag raising on the Peace Tower, to a tour of the PM's office that Trudeau prowled as a boy during his father's time, through a briefing with senior staff and then a limo ride to the swearing in ceremony. Conservatives likely gagged at the sight, wagging a finger at the TV screen and muttering that it was yet another example of a biased news media giving fawning treatment to a Liberal, something that never would have happened for Stephen Harper -- not that he would have ever agreed to such scrutiny. In truth, the piece could have benefited from some editing -- a good five minutes of awkward Mansbridge-Trudeau small talk could have been easily eliminated. The Prime Minister himself seemed uncomfortable with the barrage of softball questions. Perhaps more cuts would have been made if the producers had more time. But still, it was a fascinating culmination to a day full of carefully crafted symbolism for the new government. The true test of the Trudeau team's openness will come when actual decisions are being made, when real people start to object, when the human beings running the place start making mistakes. On day two, the new Minister of Innovation, Science and Economic Development Navdeep Bains made the first real policy announcement -- the restoration of the long-form census -- but stumbled when he could not answer properly whether there would be penalties for those who refuse to fill out the form. It was duly noted in the coverage. Only a minister for 24 hours, Bains' communications team would have been rudimentary at best and his preparation for his first announcement was inadequate. He will be forgiven this early slip-up, but in this league, few errors are tolerated. Parliament Hill reporters are top professionals who will be ready to pounce when things inevitably go off the rails. When that happens, will the smiling ministers of day one remain available to be interrogated, challenged, or even hectored? In egregious cases, I would highlight the politician's evasiveness, playing several short clips of the non-answer back-to-back in the story. It never looked good. Message track has contributed to plummeting public respect for politicians. Now that I am on the other side doing media training myself, I always counsel clients to not avoid questions but to face them and answer them. You do not need to accept the premise if it is nasty, unfair, or inaccurate, but you need to recognize that it has been asked and respond. Journalists will have better information, readers will get clearer stories and, while politicians will not likely rise much in public esteem, at least we will all have a clearer idea of where they stand.